Safe Hosts Internet LLP has created this Acceptable Use Policy (AUP) for hosting customers to protect our resources, and the resources of our customers and peering networks in order to provide a high speed network, high availability services and to ensure that Safe Hosts Internet LLP complies with all relevant UK laws. This AUP must be read in conjunction with our General Terms of Service. It is the responsibility of all customers of the Safe Hosts Internet LLP network and services to ensure that they comply with the latest edition of the AUP at any given time. This AUP may be revised, without notice, at any time, at the sole discretion of Safe Hosts Internet LLP. Completion of the relevant application form, or connection to the service for the first time, is deemed to be an agreement to our Terms and Conditions and this AUP. In the event of a breach of this policy, Safe Hosts Internet LLP reserve the right to terminate all or part of any service with immediate effect, without recompense, and delete any files held on our servers. It is also a criminal offence under UK law to knowingly infringe intellectual property rights, such as copyright, patents, database rights and registered trade marks. Customers are reminded that sharing copyright material through the use of peer to peer software may consequently constitute a criminal offence if done without permission of the right owner in question. Safe Hosts Internet LLP will co-operate with any agency or rights holder wishing to assert their rights in these matters and Safe Hosts Internet LLP reserve the right to withdraw service under such circumstances. Under the Electronic Commerce (EC Directive) Regulations 2002, Safe Hosts Internet LLP is in general not liable to any criminal or pecuniary penalty for any unlawful acts carried out using our service unless we have actual knowledge of those unlawful acts. Accordingly, if we become aware of credible evidence that a customer has carried out any unlawful acts we will take preventative measures to bring those acts to an end. 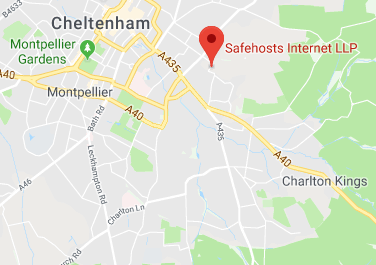 By connecting to the Safe Hosts Internet LLP network, Customers agree to hold Safe Hosts Internet LLP harmless in the event of any legal claim regarding our services. Customers acknowledge that they have a responsibility to ensure that their connection is not used in an irresponsible manner. Safe Hosts Internet LLP deem irresponsible use of the services to include, but not be limited to, sending unsolicited e-mail (“spamming”), attempting to breach the security of a 3rd party machine or if a service with unlimited or uncapped data usage is abused to the extent that it detrimentally affects other customer’s services. Customers may not use Safe Hosts Internet LLP’s web storage to host or link to torrents of any nature, for the archiving, back up or storage of the customer’s website or to back up of any other device, the storing of streaming media or the storing of private media such as private photographs. The web storage may also not be used as a platform for sending or receiving emails and all files stored in the web storage must be http accessible. Customers are advised that statistical analysis programs can be resource intensive and Safe Hosts Internet LLP advises that only data relevant to the Customer’s website should be stored. Customers are responsible for monitoring the resources used by statistical analysis packages and for identifying and resolving any issues that may arise. SHB Storage should only be used for backup storage. At no point should virtual hard drives be mounted via the SHB platform. At no point should direct access to SHB Storage be made public in any way. The /30 network provided for SHB Storage is unique to each user. At no point should any IP information be shared with any party other than Safehosts. In the event that a customer’s services are used for any purpose that Safe Hosts Internet LLP deem irresponsible then Safe Hosts Internet LLP reserve the right to suspend the service while the usage is investigated in consultation with the customer. Should the investigation determine that the service has been used irresponsibly, Safe Hosts Internet LLP reserve the right to terminate the customer’s account with immediate effect. Wherever possible the customer will be notified in advance of any termination. Login names and passwords must be kept secret and not be communicated to any third party. Safe Hosts Internet LLP must be notified immediately if they are compromised. If a customer forgets or loses their password, they will need to contact support to have it changed. If Safe Hosts Internet LLP find malicious traffic emanating from a customer’s server, Safe Hosts Internet LLP have an obligation to our other customers and peering networks to take urgent measures to block that traffic. In many cases, this can be achieved by selective port blocking, but in other cases, this will involve disconnecting and suspending the account until the issue has been resolved. Safe Hosts Internet LLP understand that in many cases a customer may not be responsible for or aware of the problem, and therefore Safe Hosts Internet LLP will work with the customer to resolve the issue as efficiently as possible to restore normal service. Proxy servers and services are not permitted on Safe Hosts Internet LLP’s network under any circumstances. Customers may not use Safe Hosts Internet LLP services to send unsolicited commercial email (UCE, also known as ‘Spam’). Safe Hosts Internet LLP will block the mail services of any customer found to be sending such mail. Customers may not have ‘open mail relays’. Safe Hosts Internet LLP will close the relay or connection of any customer found with an open mail relay. By uploading to a Safe Hosts Internet LLP dedicated server, the customer will be deemed to have accepted and agreed to Safe Hosts Internet LLP’s General Terms of Service. The customer will be responsible for the content on their server, including obtaining the legal permission for any works they include and ensuring that the content on the server does not violate UK law. Safe Hosts Internet LLP reserve the right, without notice or explanation, to remove from the network a server which does not comply with this AUP or our Terms and Conditions, such as one storing material of an adult nature or pirated software. Safe Hosts Internet LLP reserve the right to remove a server from the network, if it is deemed to be causing excessive load or traffic, is adversely affecting the performance of other servers on the network, or is being abused by an external entity. It is the customer’s responsibility to ensure that their scripts are not vulnerable to these problems. The customer agrees not to advertise their Website via unsolicited commercial e-mail. Safe Hosts Internet LLP reserve the right to suspend a site which has been ‘spamvertised’ at any time. Safe Hosts Internet LLP do not impose quotas for data transfer on dedicated servers. However if a customer is using an excessively high volume of bandwidth for data transfer, Safe Hosts Internet LLP reserve the right to revert to its terms and conditions and impose a charge for high usage. We ask customers who intend to use high volumes of bandwidth for data transfer to first discuss their requirement with the support team. Customers will be held solely responsible for any defamatory, confidential, secret or other proprietary material made available via their dedicated server. Safe Hosts Internet LLP reserve the right to remove from the network any server containing such material. Customers must be careful when using peer to peer networking software to ensure that they do not download or transfer material which they do not have the right to download or transfer. Login names and passwords must be kept secret and not communicated to any third party, except for agencies, such as Webpage designers, working on the customer’s behalf. Safe Hosts Internet LLP must be notified immediately if they are compromised. If someone were to gain access to a customer’s account password, they could tamper with files held on the customer’s server. Any IP addresses assigned to customers are owned by Safe Hosts Internet LLP . When using a quota-based service, it is the customer’s responsibility to remain within their usage quota. Depending on the service in question Safehosts reserves to right to charge additional fees for use above any quota and/or delete files for over-quota users if disk space is affecting the normal running of the server. Using the Services for any activity which adversely affects the ability of other people or systems to use Safe Hosts Internet LLP’s Services or the Internet; this includes “denial of service” (DoS) attacks against another network host or individual user. Interference with, or disruption of, other network users, network services or network equipment is prohibited. It is the Customers responsibility to ensure that their network is configured in a secure manner. A Customer may not, through action or inaction, allow others to use their network for illegal or inappropriate actions. A Customer may not permit their network, through action or inaction, to be configured in such a way that gives a third party the capability to use their network in an illegal or inappropriate manner.